British manufacturing has been on the agenda for a number of years now; the notion that it's declining, not exciting anymore and all that. Well at Sizer Ltd, here's a good news story to buck all those myths: A brand new British-made Orbit-70 Pellet Press being delivered to a multinational customer this week.Sizer have manufactured the new pellet press and provided pelleting expertise to a Scottish maltings company who pelletise the waste maltings product which then goes off to become either animal feed or biomass fuel. "This is the first pellet press to be delivered into this industry for a number of years, explains Nick Finch, Sizer's technical director, and its great that they have choosen Sizer to supply new equipment, primarily because of high quality manufacturing and British-based technical support unit. "Sizer has been manufacturing Pellet Presses for 100 years, and is celebrating the centenary of the first patented pellet press by Albert Sizer in 1912. The early presses were used purely for compounding animal feed, but now the modern Orbit pellet presses are installed in various industries including Biomass, Waste & Recycling, Plastics, and specialist pet feed.For further information visit our website www.sizer-pelleting.co.uk or call +44(0)1709 724279. 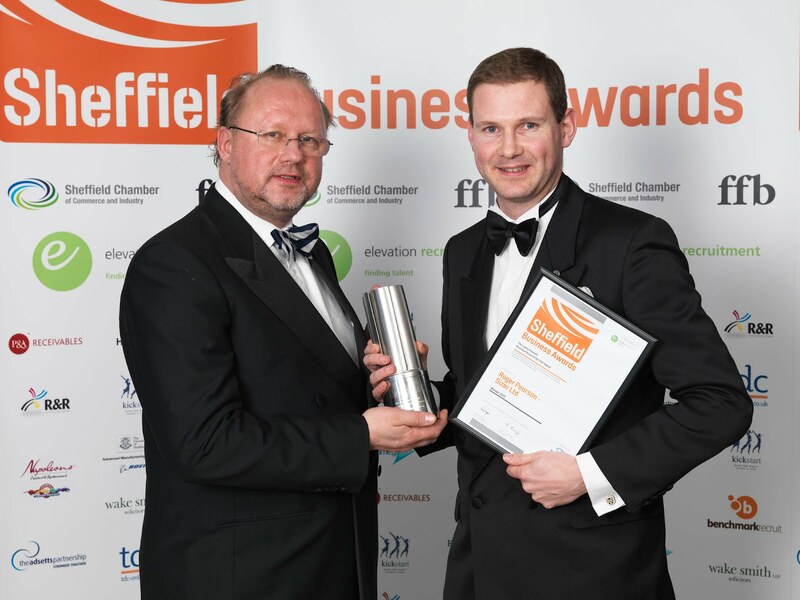 Local businessman, Roger Pearson, is celebrating his prestigious win as Sheffield’s Business Person of the Year, awarded to him last week. 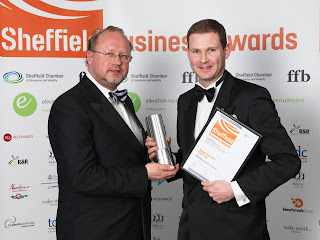 Roger, 31, who is managing director of Sizer Ltd, won the coveted award at the Annual Sheffield Business Awards, held at Ponds Forge on 19 January. The award, sponsored by Lupton Fawcett LLC, was awarded to Roger for driving significant growth for Sizer even in tough global economic conditions. In 2011 the company had an excellent year increasing sales of its pelleting equipment by 20% and in particular non-EU export sales by a staggering 85%. In addition Roger set a strategy to pursue the biomass and recycling markets, promoting the concept of pelleting materials for energy purposes, improved handling and reduced transportation costs. “It’s fantastic to be recognised by the Sheffield business community in this way, and it’s a privilege to have won this award”, Roger explains. Roger was also recognised for his continued contribution to promoting STEM (Science, Technology, Engineering and Mathematics) in local schools, as well as being an active member of JCI Sheffield. He was shortlisted alongside James Hinchcliffe of VOICE Group, and Louisa Harrison-Walker of Benchmark Recruit. Sizer Ltd manufactures the Orbit pellet presses and associated spare parts at its facility in Rotherham. The company has roots back to the original pellet press patent from Richard Sizer Ltd in 1912 and now supplies equipment across the globe to various sectors including animal feed, biomass, food & drink and recycled materials. A NEW initiative to prepare pupils from South Yorkshire schools for a career in engineering has been paying dividends. The Work-wise initiative has been hailed as “the ultimate job interview”. It aims to give pupils a taste of working life and a better understanding of the skills they will need, while also showing them that apprenticeships could offer a far cheaper route to university qualifications. Managing director Vince Middleton, who is a co founder of Work-wise, says manufacturers needed one route to enable them to engage with schools, provide meaningful work experience, assess the future employability of young people, and provide guidance where needed. “The ‘hands on’ approach also helps equip young individuals with the skills and attitude necessary to get a job straight from school, living up to the Work-wise description as the ultimate interview,” said Mr Middleton. Newburgh’s Work-wise successes include Ryan Froggatt and Adam Flood. It is with great pleasure that we can announce that our Managing Director, Roger Pearson, has been shortlisted for the prestigious award of Sheffield Business Person of the Year 2011. This is a great achievement in its own right as the shortlist of 3 people has been selected from a record number of applications this year.In the last year the company has seen growth in new and exciting areas such as Biomass, Recycled material and Specialist feeds pelleting. It has also seen huge growth in its export markets in the Far East including Japan & South Korea. "It's been a very exciting year for Sizer, and I hope that things continue to improve into 2012 and beyond." explains Roger. 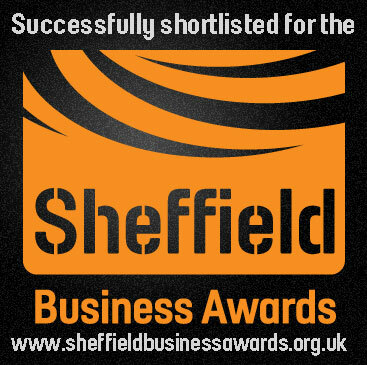 "I am very honoured to be nominated for this award, but as always, the Sizer team have made this happen. It would not have been possible without their determination and passion for pellets! "Sizer Ltd, a member of the Sheffield Chamber of Commerce, manufacturers Pellet presses and associated spare parts in their Yorkshire factory. Having recently celebrated their 110th anniversary, the company looks forward to helping clients with pelleting solutions for the next 110 years.The awards ceremony takes place on 19th January 2012 at the spectacular Sheffield venue of Pond's Forge. Sizer has been invited to speak at the Malaysian biomass conference Biomass-SP in May 2012, a joint EU-Malaysian collaboration project. Specifically the paper and presentation will describe Sizer’s latest work with the pelleting of palm tree fibres and kernels. The project is in collaboration with our equipment partners CHE Pte Ltd based in Malaysia and Singapore. Pelleting trials are ongoing at our facility in South Yorkshire to determine the most effective way of pelletising these palm residues (OPT pellets pictured). The results will be presented at the international conference next year. There is currently 19m tonnes of palm waste that can be diverted into biomass fuels and Sizer is at the forefront of providing pelleting technology into this market. Sizer Ltd will be exhibiting at the largest animal feed and biomass pelleting conference in Asia next year. Victam Asia 2012, which will be held in Bangkok from 15-17th Feb 2012, brings together an international audience of feed and fuel producers to see the lastest in pelleting technology.This is the first time that Sizer have exhibited at the Asian event for 21 years, and with the expansion of business in South East Asia and Australasia, it is an ideal event to welcome all of our existing clients and agents, as well as inviting new sales agents to visit our stand D045. "We are looking forward to seeing our loyal, existing partners," explains Suzanne Birley, commercial manager, "and invite other potential partners to visit our stand, who can help us promote and sell our Orbit pellet presses and pelleting spare parts to the Asian markets. "Sizer manufacture the Orbit pellet press range which is designed and engineered in the UK. 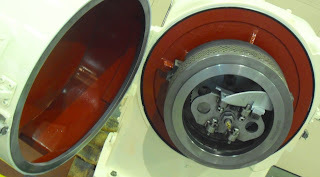 The company also supplies spares parts for various other pellet presses including CPM, Buhler and Milltech machines.If you wish to find out more information visit our website www.sizer-pelleting.co.uk or call Suzanne Birley on +44(0)1709 724279. 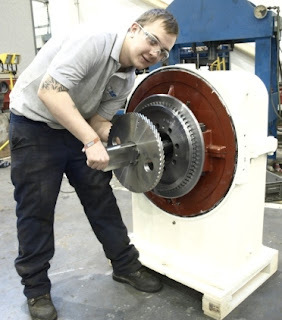 Sizer welcomed our new engineering apprentice, Adam Flood, to the team in September 2011. Adam will be working with our Service Engineer to learn more about our pelleting technology, and is the first apprentice at Sizer since the 80s. "It's exciting times for Sizer at the moment, as the business moves into the biomass and recycling sectors" says Roger Pearson, managing director, "and Adam will be helping us service this expanding market in the UK and Europe." he adds.Sizer are a British manufacturer of Pelleting Presses and equipment. Based in the industrial heartlands of South Yorkshire, this 'Made In Sheffield' company is growing fast in renewable fuels material recovery industries, in addition to supporting its clients in the animal feed sector and expanding export markets in Japan, Canada and Australia. Sizer have been exhibiting at the global pelleting conference, Victam 2011 in Cologne, Germany. 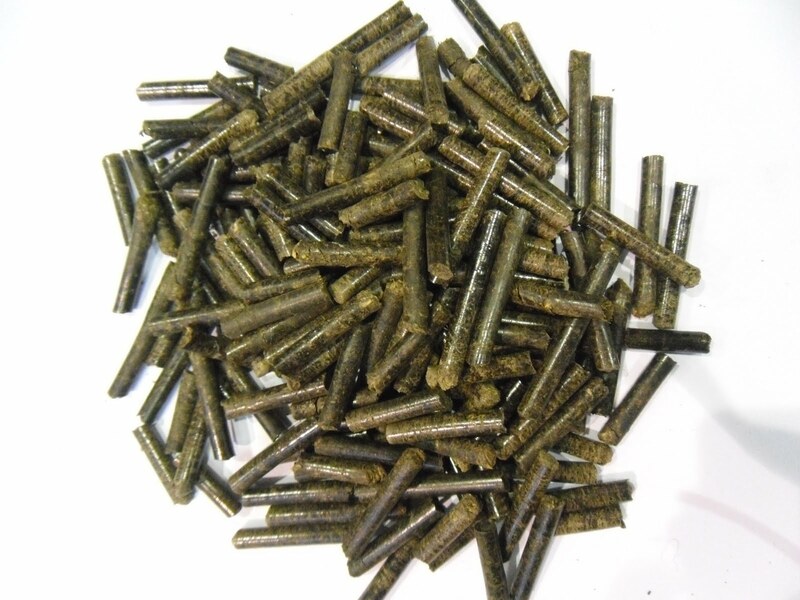 The team presented their pelleting expertise with an array of precision-made Pellet Press spare parts. The team hosted many international clients, building exisiting relationships and forging new ones. All visitors to the stand were impressed with our association with 'Made In Sheffield': the world class quality mark.Sizer manufacture & supply spare parts for various types of pellet presses from CPM to Milltech to Buhler. The company also engineer the British-made Orbit pellet press range used in Animal Feed production as well as Biomass and Waste to Energy pelleting. For more details visit our website: www.sizer-pelleting.co.ukPictured from left: Suzanne Birley, Nick Finch & Olle de Roos. International students from Sheffield Hallam University Business School have been helping Sizer Ltd to build international links with Spain and Italy.South Yorkshire-based Sizer set the 7 students the task of sourcing information on agents within Spain and Italy as part of its ambitious global expansion plans supplying pelleting equipment and spare parts.Suzanne Birley, Commercial Manager explains: “Spain and Italy have massive pelleting industries both in the animal feed and bio-mass markets. The linguistic skills of the students will help massively in our research and allow us to identify the opportunities to increase Sizer’s presence in these countries”. From Animal Feed to Renewable Energy and More…Sizer Pelleting Solutions has a quality problem with a difference. Its machines are simply too good. For nearly 90 years, Sizer has sold its animal feed pelleting machines around the world and they just kept on working, requiring limited maintenance and seldom needing to be replaced.That said, the team still sees scope for expansion in its historical markets and new opportunities are opening up for innovative applications for its technology in the energy and construction industries – not to mention literally at the other end of the animal food line, manure.The company has been looking long and hard at other applications and other materials that could benefit from pelleting, focusing on the burgeoning opportunities offered by recycling and renewable energy.They have teamed up with Hallam Energy, the consultancy set up by Sheffield Hallam University to help businesses to benefit from the energy engineering expertise of its materials and engineering research institute. “We ran a project with Hallam Energy to look at what we could do to move these machines into different markets – primarily the market for wood,” says Roger Pearson, Managing Director.“As a result we could see there were other things pelleted.”One of the first products Sizer looked at pelleting was wood. “Pellets can be made from virgin wood that has been dried and we are also looking at waste wood – off-cuts from joiners and saw mills, saw dust and material collected by extraction fans,” says Mr Pearson.“The lignum is still there, which helps it bond when you compress it in a die to form the pellet, it’s easier to transport – you may need one lorry where previously you needed three – and you can sell it as a fuel or for animal bedding because it is dust free and absorbent as well.” Wood is more difficult to process than animal feed. A machine that will produce 10 tonnes of animal pellets in an hour may only produce three tonnes of wood pellets. “We are re-engineering the bits inside that take a bit of a hammering,” says Mr Pearson. “We are still designing and developing.” Sizer’s machines have already been used to make fertiliser pellets from chicken manure and slug pellets from sheep’s wool (the slugs hate the fine scales and small barbs on the tips of the wool fibres), as well as the chemical variety. A new face on the team. Famous Sizer brand returns to pelleting market. Want to turn your waste into cash? That’s the question we’ll be asking visitors to our stall at the Great Yorkshire Show this July! We’ll be demonstrating that with our versatile Sizer S pelleting machine, you can turn waste farming products like paper, wood chippings and manure into pellets that you can either use yourself as a fuel source or sell on. This innovative idea can help those in the farming and equestrian industries boost their income, by turning waste into a valuable product. 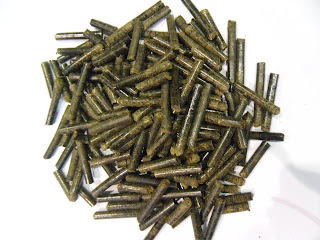 Pellets provide a uniform size and shape for traditionally bulky/difficult materials, making handling and transportation easier as well as drastically reducing on storage volume. There’ll be live demonstrations of our Sizer S pelleting machine at the Great Yorkshire Show, which is being held in Harrogate on 13-15 July. In the Renewable Energy area, we’ll show you how effective our machines are as well as demonstrating how far the possibilities stretch when it comes to pelleting new materials. Come along to our stand to take advantage of our special Great Yorkshire Show discount – 10% off orders placed on the day – and take part in our ‘guess the weight’ competition to win a digital camera. Over 30 delegates from the world of animal feed, recycling and waste management, along with a number of local VIPs, attended a special event held at Sizer recently to mark the official launch of the organisation to potential new markets. The company, which is part of the Newburgh group, was keen to demonstrate its expertise in providing pelleting solutions for a wide range of different materials, including paper, wood, distilling by-products, pet food, bedding, flour milling, fertiliser and animal feed. Delegates were welcomed by Newburgh chairman Vincent Middleton and given an insight into the exciting history of the Sizer name, which traces its roots back over 110 years to Richard Sizer, who invented the first commercially viable pelleting press under the Orbit brand. Managing director Roger Pearson then provided details of Sizer’s exciting plans, which includes the design and manufacture of a new bespoke range of pelleting presses suitable for a wide variety of materials, from domestic to large scale factory usage. He also outlined how the company is currently carrying out pelleting trials on behalf of customers, as part of improving handling for waste product and providing a more carbon neutral way to heat factories and buildings. Supplying spares and repairs for any brand of pelleting press is also an important part of Sizer’s business and Roger demonstrated at the event how the company provides an exceptional response to servicing, repair and maintenance requirements, whether from customers in the UK or worldwide. Guests were then given a demonstration of how the Sizer pelleting presses work by production engineer Graham Turner. He showed delegates how office waste paper can be shredded, combined with 10% water, put through an Orbit press to produce pellets that are easy to handle and can be re-used in factories for example to soak up liquid spills such as oil. Pelleting is being used more and more as an environmentally sound solution to many transport and energy problems.Please contact us to find out more. Sizer will be at the Victam Asia 2010 exhibition in Bangkok, Thailand from the 3rd to 5th March.Come along and Meet Suzanne, she will answer any pelleting questions you may have. ﻿A few years ago Newburgh acquired OSL Pelleting. After a successful time and through talking to our customers we have come to the conclusion that you love the original Sizer name sowe’ve decided to change our name to Sizer Pelleting Solutions.Along with the name change came a whole rebranding, bringing our literature and website up-to-date.